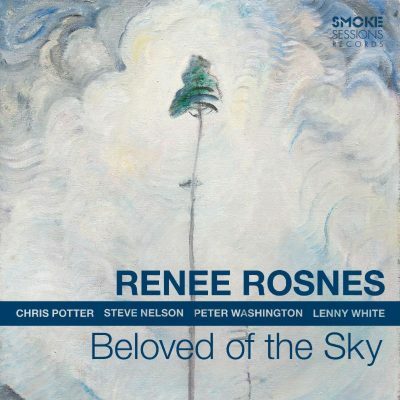 There’s a painting by Emily Carr that evokes much of what I admire most about Renee Rosnes, and it’s not the painting Rosnes had in mind when she named this album. She selected the title in homage to one of Carr’s best-known works, an expressionistic landscape that Carr called “Scorned As Timber, Beloved of the Sky.” Painted in 1936, when Carr was 65 and at the peak of her creative powers, the titular canvas depicts a hilly swath of largely barren land in western Canada, an area ravaged by merciless lumbering. We see rows of rotting tree stumps, which Carr conceived of as tombstones, elegies to the forests slaughtered for timber. In the center of the canvas, surrounded by the stumps, is a stalwart surviving tree — reed-thin and branchless but standing tall, impossibly tall. At the tip of the trunk, piercing the clouds, the tree is in full bloom. It towers above the despoiled landscape in mournful defiance of human cruelty, a testament to the resilience of nature and the hope it can instill in those attuned to it. Carr painted another canvas in 1912, after she returned to Canada from a visit to Paris, where she had studied at the Academie Colarossi and discovered the Fauvists and Impressionists. 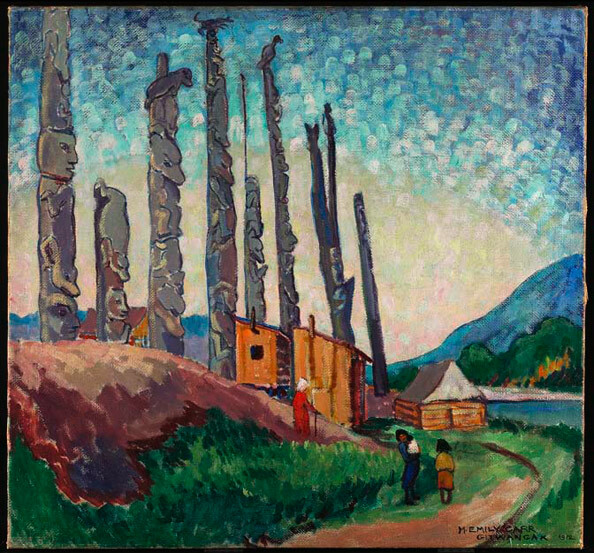 Titled “Gitwangak,” the original name for a part of British Columbia that English settlers renamed the Queen Charlotte Islands, the work captures a scene in a small village of First Nation longhouses along a riverbank. We see three people in the foreground: one dressed in red, wearing what appears to be a white headdress; and two others, one adult and a child. Nine tall totem poles, carved with renderings of emotive faces, loom amidst the structures. In the water, in the distance, a steam ship floats by. The sky sparkles with painterly dabs of vermillion, silver, white, and gold. With “Gitwangak,” Emily Carr brings to mind, for me, all that Renee Rosnes achieves as a composer and pianist. It honors a long and rich tradition: in Carr’s case, the way of life of the original people of the Pacific Northwest; for Rosnes, the deep and complex legacy of jazz music. At the same time, both the painting and Rosnes’ music are keenly steeping in their own time and utterly contemporary in feeling — in some ways, in fact, radically so. The visual style of “Gitwangak” is boldly post-Impressionistic, with color effects and textures suggestive of Van Gogh. As Rosnes makes clear with the first piece on this album, “Elephant Dust,” her work is fearlessly daring and original. Rosnes, in all her music culminating in Beloved of the Sky, has proven to be a composer and musician of the rarest kind, a master of a tradition that she carries forward toward the future through the force of her authority, her passion, and her individuality. David Hajdu is the music critic for The Nation and a professor at the Columbia Graduate School of Journalism.